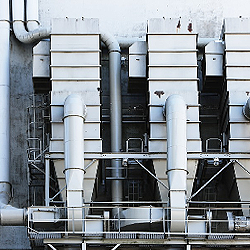 Blog: Environmental control systems, the heating coils and chillers that populate the recesses of large structures, are designed to match buildings in every imaginable way. Occupied commercial structures employ a large workforce, which causes humidity and body-generated heat. Industrial complexes are no different, with long production lines introducing hard-to-regulate quantities of heat. A commercial and industrial cooling tower system offsets the temperature rise, but what happens when everything grinds to a stop? These systems can’t afford to be offline for any amount of time because excess heat equals human discomfort, possible contamination, and heat-related equipment failure. If an environmental control system breaks down, the occupants of the building are in for a rough time. Windows can be opened, assuming we’re talking about a traditional structure, but that’s no way to run a productive business. A commercial and industrial cooling system requires a proactive solution, a maintenance strategy and in-situ repair plan that can return offline cooling equipment to its former functional best without incurring large stoppage intervals. One partial solution here is a series of redundant motors, filters, and pumps. If one device fails, the system simply automatically switches over to a secondary unit. A more comprehensive answer to the time factor problem is the incorporation of an onsite breakdown prevention plan, a preventative maintenance strategy and onsite equipment replacement policy that ensures critical systems are never out of action for long. Productivity is a word that gets thrown around far too much, but it’s a difficult term to escape under the twin domains of industry and commerce. For example, a hot factory must operate as efficiently as possible, which means operating conditions must be optimal. Cooling equipment keeps the equipment operating within thermally approved standards. A more dramatic example would be a hospital or a computer server room. Both of these examples must access great pools of cooling energy. Additionally, the hospital demands special filtering assemblies and extra cleaning work, the HEPA filters and rigidly structured sanitary cleansing routines that stop microbial contaminants from joining the fresh airflow entering the building. Quite frankly, stoppages cannot be allowed in these instances, which makes an in-situ repair an essential skill. Occupancy and function define the requirements of a commercial and industrial cooling system. Redundant secondary systems stop breakdowns from developing into catastrophic scenarios here, but only a full-on onsite maintenance and repair strategy can do this situation justice.